A Modular Synthesizer Is Coming To My Studio! This is big news for me: I was able to raise independent funds for putting together a Modular Synthesizer (Thank YOU, Konny!!). I chose the Eurorack standard, which is supported by many manufacturers, and I just ordered 26 modules of the Doepfer A-100 system. That’s just a few more than the system in this picture. Some of them are much larger, though, so it looks like there is a lot more. I am getting it all built into a flat and low desk. It will arrive as individual components, which my occasional musical collaborator Bellows is going to assemble for me. 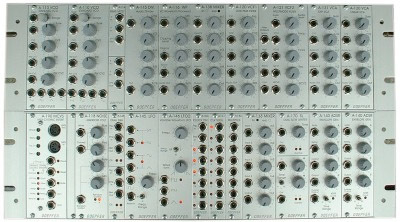 Modular synthesizers are not really for playing tunes. This one will do a lot of processing of prerecorded sounds, but its main job will be making patterns and textures and exploring entirely new sounds. This entry was posted in Modular Synthesis. Bookmark the permalink.